I had been researching getting [Laser Vision Correction] for about 10 years before actually deciding to have the procedure. What helped me make my final decision was my co-worker. He had been experiencing serious issues with his eyes due to a history of retina detaches and cataracts. One day he came to work and no longer was wearing his eyeglasses. 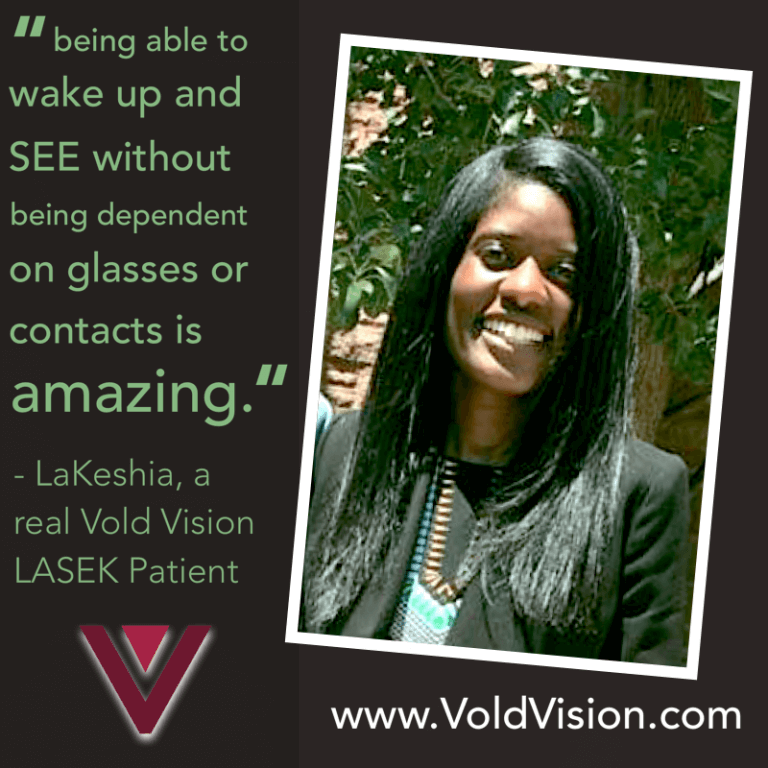 When I inquired, he informed me that Dr. Vold had performed his procedure and that he no longer needed his glasses. To myself, I thought, if my co-worker could be cured, I knew I was going to be OK. Also, I was running out of contacts and didn’t really want to continue purchasing. These two factors are what helped me make my final decision to have this procedure done by Dr. Vold. I had worn glasses since the first grade. I was one of those children who faked her eye exam because I really wanted glasses. As I grew older, my vision worsened and i was very dependent on my glasses / contacts. My vision was so bad, I wasn’t able to see the anything unless I had it right up to my face. Even the ‘E’ that the doctors shows during my exam was blurry. I knew at that moment it had gotten bad and that I needed to stop procrastinating and just take the leap. Being able to wake up and able to see with out being dependent on glasses or contacts is AMAZING. Not having to worry about your glasses fogging up when you walk outside definitely is a wonderful experience. Jumping in the pool and actually being able to see underwater is pure bliss. If someone were to ask me about my procedure, and many have, I ask they why haven’t they already signed up for it. A co-worker of mine just had a procedure to remove a cataract and insert a lens into his eye. When he came back to work with no glasses on, I knew it was a miracle. Dr. Vold had did what I thought was impossible. I still give my co-worker a hard time about that. I told him that Dr. Vold and Jesus have similarities. He can help the blind man see. My co-worker didn’t think that was funny but I told him it was a sign from God. The cost of having this procedure done in AR is definitely one of the most cost friendly. This procedure in Atlanta, where I lived prior to moving to Arkansas, would have cost me approximately $2000 more. Had I known that this procedure was going to be this easy, I definitely would have had the procedure done sooner.